Free Practice for the Indian Grand Prix began with just a short stint for Fernando Alonso. Six laps under his belt and the Ferrari driver's gearbox gave up, forcing an early end to his session. It was otherwise a quiet practice, Pastor Maldonado went off track and Lewis Hamilton also had a brief excursion through the gravel. James Calado was in Paul di Resta's car at Force India, taking it for a spin. Literally. He recovered and continued, finishing the morning 18th. 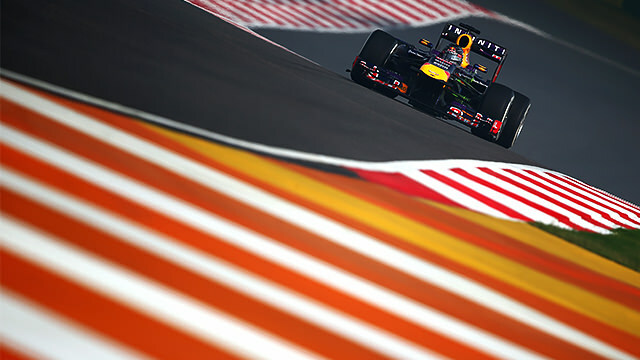 The fastest three were Sebastian Vettel, Mark Webber and Nico Rosberg. The second session was a lot quieter than the first, although Williams had another serious issue with their tyres. Pastor Maldonado's wheel nut popped off, the car ran over it and picked up a puncture, whilst the nut itself went rolling off down the track. Luckily it didn't hit anyone or anything else, but it's the second race weekend in a row that Williams have had tyre safety problems. Meanwhile, Vettel had something of a KERS issue but it didn't stop him going fastest, with Webber behind and Romain Grosjean best of the rest.